Good morning gentle reader, I hope you have forgiven me for the lack of a Wordy Wednesday post last week, caused purely by my bad planning. Luckily this week is a lovely treat so it should make up for it. I would like to introduce the lovely Rachel Ward. Rachel Ward’s first book, Numbers, was shortlisted for the Waterstones Children’s Book Prize, has sold to 26 countries and been optioned for film. She has had five novels published by Chicken House in the UK, and is currently writing a science fiction thriller for young adults and a detective novel for adults. Why did you start writing? Just to see if I could. I used to listen to the Afternoon Play on Radio 4 every afternoon in the car when I collected my kids from school, and I wondered if I could write one. I did, but it was rubbish. Still, it got me started. 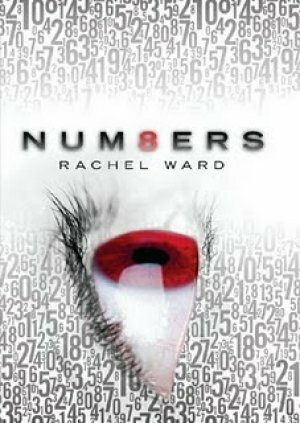 I wrote some short stories and then two books for younger readers before striking lucky with my book for teens, Numbers, which was published in 2009. Do you write to a schedule, eg every day or three times a week, set times, etc or do you write as and when the mood strikes? I try to write every day that I am at home, at least 1000 words a day, although I don’t beat myself up if I don’t achieve that. I write mostly in the morning, 9ish to 12ish, but if I haven’t written enough or I’m mad keen to continue I’ll have another writing session at the end of the afternoon. Is writing your main source of income, I read lots of articles saying writers make no money, and my readers asked this question a lot! Can you survive on book writing alone? if not, what else do you do? Yes. 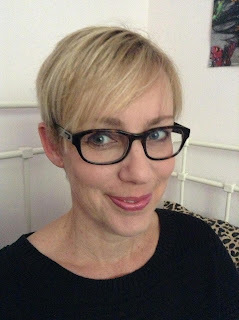 I had a part-time job with my local Council to start with, but became a full-time writer nearly 4 years ago. I’m able to do this because my books sell widely abroad – foreign sales are a huge boon to a writer and I am very lucky that my UK publisher, Chicken House, are brilliant at selling foreign rights. What are your favourite biscuits? Dark chocolate ginger biscuits, although I am also partial to a garibaldi. Both excellent choices! Tea or Coffee? Yes please. Where do you do most of your writing? At my desk in the sitting room. It’s by the front window so I don’t feel too cut off from the world. Do you use social media (facebook, twitter, instagram etc) to engage with your audience, do you think it helps sales and do you find it fun or a chore? I use Facebook and Twitter an awful lot. I used to love chatting with my friends in the office, so FB and Twitter are a substitute for that. I don’t believe they have helped sales very much (but who knows? ), but I enjoy them. If you could genetically cross an animal with a fruit or vegetable what would you choose and why? I'm currently keen on a Broad Bean Beetle, I'm not sure why...squishy though.. I’m going with a Pumpkin Cat which would look very Bagpuss-like. If money was no object what would you buy your favourite person for Christmas? If money, morality and ethics were no object I would buy my husband a new heart. He’s currently living in hospital waiting for a transplant. You can’t buy good health, though, and we are utterly dependent on the NHS and on people thinking about organ donation and talking about it with their families. If they haven’t already, perhaps your lovely readers might consider registering on the organ donor register. I’m asking selfishly, of course, but there are thousands of people waiting for kidneys, lungs, livers, etc. and those who make the decision to donate are absolute heroes. I'm sure I speak for all my readers when I wish you and your husband the very best, and while not wanting to wish ill on anyone one else, I hope that he is matched to a heart soon. Numbers "Since her mother's death, fifteen-year-old Jem has kept a secret. When her eyes meet someone else's, a number pops into her head - the date on which they will die. Knowing that nothing lasts forever, Jem avoids relationships, but when she meets a boy called Spider, and they plan a day out together, her life takes a new twist and turn. Waiting for the London Eye, she sees everyone in the queue has the same number - something terrible is going to happen." 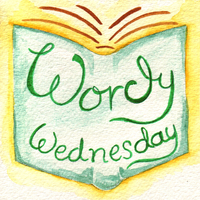 Feel free to grab this badge code for your blog and share the Wordy Wednesday love.